There is no doubt, Vista’s toolbars are different from XP toolbars. The purpose of this page is to help you create Vista toolbars and display them to your liking. A toolbar is block of buttons or icons, each representing a program. With all your favorite toolbars in your favorite places, you save time and especially save the frustration of searching through menus. Some toolbars, such as the Quick Launch toolbar, appear on the taskbar. When you logon to Vista, at the bottom of the screen is a black Taskbar, which is a container object for toolbars and also includes the navigation area. The default toolbar in the taskbar is called Quick Launch. An early decision is whether to unlock the Quick Launch, or leave it locked. The benefit of unlocking is so that you can add more program shortcuts to that black bar at the bottom of the screen. If you don’t see the Quick Launch toolbar, right-click an empty area of the taskbar, click Toolbars, and then make sure there is a tick next to: ‘Show Quick Launch’ – see screenshot. Your first decision is whether or not to tick: ‘Lock the taskbar’. I prefer to unlock because this allows me to add more shortcuts to the Quick Launch toolbar. Adding Icons with Dragon Drop! I once received a funny email which asked me to explain how to add an icon to the Quick Launch menu, the email request said, ‘Guy please demon strate the dragon drop’! Whether you are a beginner, or an old hand who has not customized the Quick Launch for a while, the drag and drop (dragon drop) method is as follows: click the icon of the program and then drag it to the Quick Launch toolbar. There are at least three ways of finding suitable programs to populate the toolbars, Start Menu, Explorer and Search. Incidentally, if you have a handbag, man-bag, or a good old fashioned briefcase, once in a while your container needs a clean out, it is the same with the Vista Quick Launch area. After using Quick Launch for a while it’s worthwhile weeding out shortcuts that you never used after that first time. Many users liked the toolbar flexibility that XP offered, not only could you create your own Toolbars, but also you could customize them. 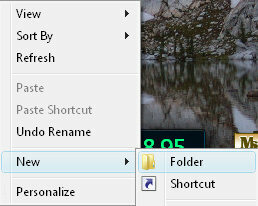 At first sight, there is no menu in Vista where you can make a new toolbar, let alone populate it with your old friendly shortcuts. The trick in Vista is go to the desktop and create a plain folder, then, when you drag it to the edge of the desktop a miracle takes place, the folder transforms into a toolbar. To tell the full story, click on the yellow folder on the desktop, now, with the left mouse drag the folder to the very, very top border – then let go. Hauling the folder to the side of the desktop did not work for me, it had to be the top. A promising sign was when the mouse displayed a plus sign (+), at this point I let go of the mouse and a toolbar magically appeared. Once the new toolbar is born, you can drag shortcuts into the container, just as you would for the default Quick Launch toolbar. Take a minute to discover what is possible by right-clicking and examining the menus. For example, decide on the Icon size, and whether to Show Text or Show Title. If a toolbar suddenly appears for no apparent reason, you can close it by right-click on an empty space in the new toolbar, and choose, ‘Close Toolbar’. Now that you know how to create a new toolbar in Vista, then you can see how it’s possibly to produce a phantom toolbar by inadvertently dragging a folder, or even the Computer icon to the edge of your screen. To create a toolbar in Vista you have to employ a different technique from that used in XP. What you need to do is create a folder, then drag it to the very top of the screen, once you see the plus sign let go of the mouse, you have just created a new Vista Toolbar.